It is a great honor and privilege to participate in Friday’s fundraiser with Let It Shine. Great Shape! Inc. is fortunate to have LIS as its partner for their humanitarian efforts in Jamaica. REAL LIFE ROCKAZ are thrilled to take part in providing resources to Great Shape Inc’s families in Jamaica: Roots Rockin’ Reading will help fund literacy, vision, and dental projects in Jamaica. As a musician, I’ve traveled the world witnessing first-hand the conditions the majority of earth’s peoples live in. I’ve also had the unique privilege in this life, through music, to synthesize mankind’s experiences, translating them and sharing them through the universal context of music. Music is a universal language that has a unique power to influence, transform, and enrich our collective experience as human beings, and unifies all peoples of different backgrounds. Reggae music, in particular is a stylistic vehicle by which all peoples of the world can unite under, One Love. An equal honor is getting to work with the amazingly talented, REAL LIFE ROCKAZ, crew. Having recently opened for, KyMani Marley, Steel Pulse, The Wailers, and whose members have also performed with, Bobby McFerrin, Mishka, Collie Buddz, James Pants, Flowmotion, Dirty Dozen Brass Band, Delta Nove, Bayonics, and more; I can proudly say, Real Life Rockaz is one band that can hold its own anywhere. 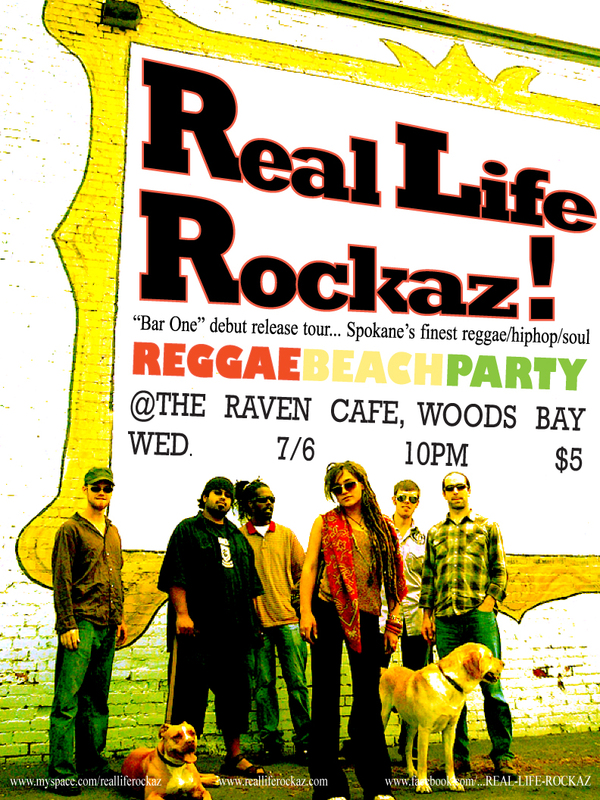 Real Life Rockaz, blend reggae, soul, hip hop, dancehall, cumbia, and afrobeat styles together uniquely incorporating W. African drumming rhythms into their high energy sets. Caribbean native, drummer, Juan Parris, who recently performed on “Late Night w/Jimmy Fallon” with world-famous folk-reggae band, Mishka, brings an authentic flavor to his drumming that is hard to find in the NW… He’s quite the novelty around here… One of the industry’s finest drummers. Front man, Paul Flores, of James Pants & the Royal Zodiac, is our group’s artistic director… A man of monstrous creativity and multi-instrumental abilities, Paul, together with our bass player/sound-engineer, Jimmie Denny, has toured Europe twice, and the US with James Pants on a Stones Throw Records-backed tour, and also played at Sasquatch music festival in 2009. And last but not least, Brook Gannon on lead guitar… He’s a 10th grade math teacher at LC High School, and an honor to have his support with Roots Rockin’ Reading, and Real Life Rockaz. In addition to Real Life Rockaz, the evening’s ALL AGES event includes live paintings for auction from two of Spokane’s finest artists, Jessica LaPrade, and Katie Brauer. If you went to any of the “WOMP” shows in Spokane last year, you’ve seen these artists’ paintings. Both artists use the energies from the audience to create their unique masterpieces while the band plays… Another beautiful way to unite and celebrate One Love! You’ll see some gorgeous hand-blown glass creations from local glass artist, Royal Stumph, and hand made rasta-colored candles from Let it Shine’s very own, Valerie Bacon. All art will be auctioned-off between music sets. Such a wonderful honor to participate in Great Shape! Inc’s, “Roots Rockin’ Reading” fundraiser at NYNE bar/bistro. Big thanks to everyone for their hard work, and to NYNE for accommodating this event. This event will make a big difference in the lives of many underprivileged Jamaican youths. For only $10 you too can make some change. Let’s play for “change”! See you Friday!